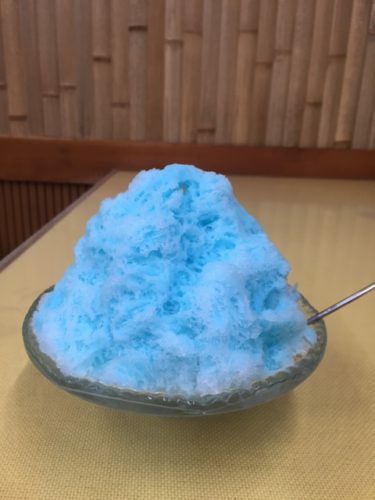 HOURAKU MANJU is well known for its snacks filled with sweet azuki, but during summer, what attracts people most to the shop, is its shaved ice, especially “Cobalt”, famous blue-colored shaved ice which have been loved for years! To many Kumamoto natives, hearing the name “Cobalt” reminds them of their summer memories. Why don’t you experience Kumamoto summer tradition yourself? HOURAKU MANJU is a Kumamoto specialty with a history of over 60 years. 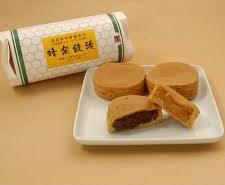 It is a Japanese snack made of batter in a special pan and filled with sweet azuki bean paste (kuro-an) or navy bean paste (shiro-an). Among Houraku manju fans it’s a popular practice to “vote” for kuro-an or for shiro-an.You can take it out or eat inside the store. Back home you can refresh it just by heating. Go along Kami-tori for 150 meters. Houraku Manju is located on your right, past Marubun Bookstore (Kappa statue) and before Kumamoto YMCA. A Kumamoto institution. Locals line up on weekends to take home boxes of manju for their family for an afternoon snack. If you don't want to take away, take a seat inside and they bring you tea for free to have with your manju. The woman who owns it is a total Kumamoto lady - sharp wit, great sense of humour and no-nonsense!